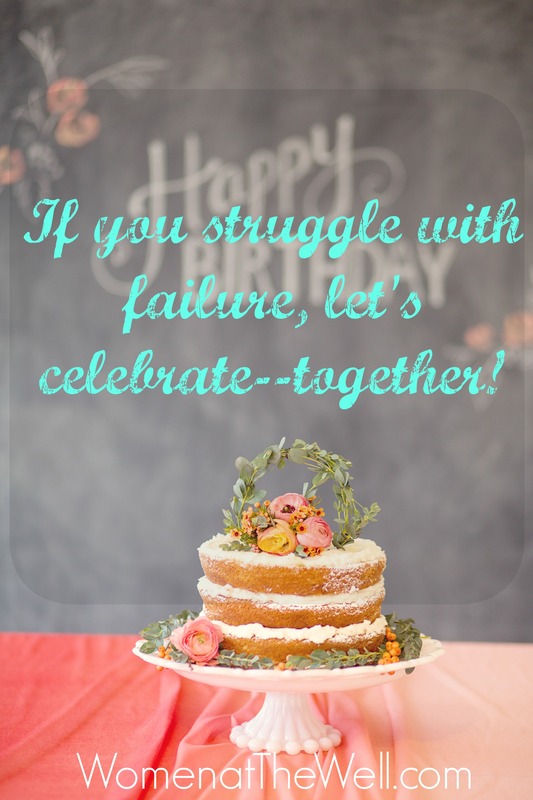 If you struggle with failure, let’s celebrate! 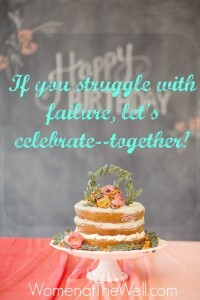 And to put a dollop of icing on the cake, it was birthed from failure. Yep. Like every other New Year’s “resolutionist,” I promised and double-dog dared myself to get the site up and running even before the New Year. But I opened up the year like a worn out basset hound instead. I started. Stumbled. Stalled. Started again. Then I sat down at the Well. And then I got down. Down on myself and down on my dreams until it sent me once more down on my knees. Remembering why I desired to have this sweet space of grace—in the first place. Where women can gather—failures, flaws, falls, faults and all, at the Well of His Word. Linking arms and touching hearts—together. Loving. Believing. Living. Serving. At the Well. So I missed the mark, and my January and February plans were a complete and total failure. But then came March, when The SONshine Box was to be featured in Guideposts Magazine with a link to THIS new blog and not my personal one. March loomed and I nearly threw my hands up and gave up. Until women came to the rescue—and to the Well, led by Merri Dennis, my right hand woman at the Well, who installed the figurative curtains here and all the pretties, and everything else. When I thought I blew it and before I even knew it, precious women trailed in to lend their stories, as warm and as welcoming to me as a counter full of rich casserole dishes and a table laid out with a rainbow spread of sweet savory treats. And just in time. When I finally held my Guideposts issue that held the inspiration for the SONshine Box and the faith for this blog—I wondered why God had me in the March issue. This Easter month. I sure didn’t plan it. And today is a save-the-date straight from Heaven. 3/16/16. 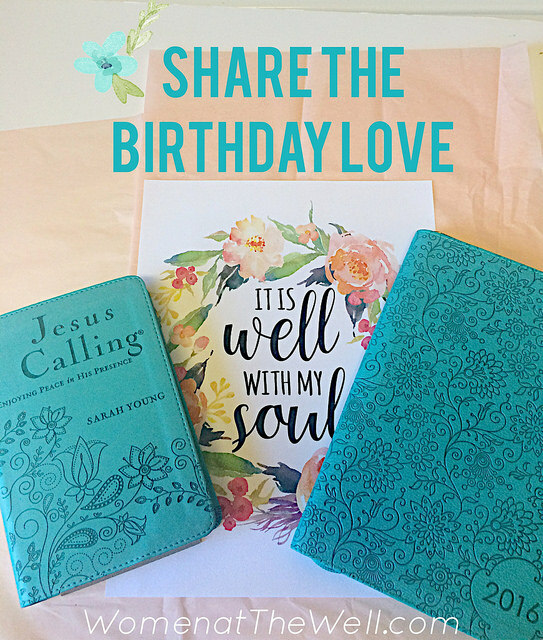 Our birthday at The Well. When we remember God already has a plan in place when we miss the mark. Reminding us that even when His creation was a complete and total failure in the beginning of time, He came to the rescue with a redeeming plan. Just in time. The salvation plan of Jesus, and He never gave up on us. He didn’t throw His hands up and give up. Jesus threw His hands out, took the marks, and gave up His life so that we could have ours back. He came through for us so that through Him we can spend eternity in Heaven. Now that’s worth a new birth celebration. So WELLcome and come on in. I’ll pour the water, warm the casseroles, no wait, let’s eat cake first. After all, it’s our birthday. 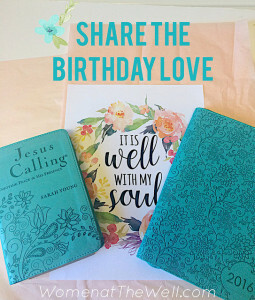 And to continue the celebration of Women at the Well’s official launch, I’d love for you to share the birthday love on social media and subscribe to our weekly blog posts, if you haven’t already.